Rory Schlein turned back the clock to capture the Scottish Open Championship crown at Armadale Stadium tonight. Schlein equalled Peter Carr’s tally of four titles with a scintillating display in the Grand Final. Up against Richie Worrall, Ricky Wells and Mark Riss, Schlein was in last place after the second bend of lap one, but fought his way to the front and breathed fresh air on his way to the winning line. Wells was second and Worrall was third. The 16 strong line-up was not, it must be said, a world class field and the entrants who carved out the podium honours at the business end of the evening were not too hard to predict. For Monarchs supporters their main focus of attention was the performances of some of the new members of the team who were riding in the event for the first time. Riders like American Max Ruml and Swede Joel Andersson were very much in the shop window, aiming to prove that they are making the relevant speedway progress the Edinburgh club are expecting from them. 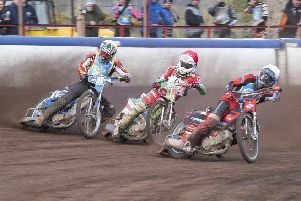 And Edinburgh, who have a reputation for inviting some unknown foreign riders to the Championship, did so again with the introduction of Dane Tobias Thomsen and German Marius Hillebrand. Thomsen was at Redcar on Thursday and is keen to gain a contract with a club in this country. Monarchs captain Erik Riss requested that Hillebrand be given a run in the meeting and Monarchs were happy to oblige. And Redcar’s Aussie Jordan Stewart was another who made his Scottish Open bow. Former Monarch Justin Sedgmen, who was crowned champion 12 months ago, recommended that Stewart was worth taking a chance with and Redcar snapped him up pre-season for their team. Unfortunately, he tumbled off in his first ride. And ex-Monarch Schlein, a three-time winner, was bidding to equal legend Peter Carr’s haul of four titles in what was the 61st staging of the Championship. He got his challenge off to a winning start when he triumphed in heat four defeating Ben Barker and Kevin Doolan. Schlein then laid down a marker for glory when he defeated Monarchs No.1 Ricky Wells in the sixth heat and was hitherto unbeaten in the qualifying heats when he headed home Erik Riss for a third victory in the 11th heat and Schlein was really looking sharp and also won his fourth outing in heat 13. And the Aussie racer sailed through to the Grand Final by becoming the only rider to score a five-ride maximum in the qualifying heats. Thomsen and Hillebrand had a tough opening heat and were relegated to third and last place respectively trailing well behind race winner Erik Riss and Glasgow’s Richie Worrall, two of the favourites for the title. And Erik Riss laid out his credentials by winning his second outing quite convincingly in the seventh heat. A little spice was added to proceedings in the second qualifying heat when Wells held out 2014 winner and last year’s Monarchs skipper Sam Masters, with Andersson in third spot, an indication of how tough the Swede found things out on track. Ruml found it no easier in the next heat when he trailed in third behind team-mate Mark Riss who held off a fierce challenge from Glasgow’s Paul Starke to take the chequered flag. Surprisingly Monarchs reserve Josh Pickering failed to score but made amends by winning his next heat in splendid fashion.